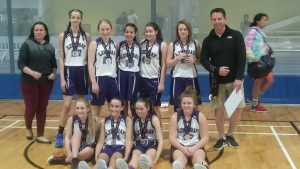 The medals keep coming in for the Lindsay Wildcats, as the U14 Major Midget Girls captured the silver at the Ontario Cup in Whitby. The girls posted wins over Whitby (55-19), and Oakville (35-27), before falling 35-34 to Toronto Triple Threat in a hard-fought final. Congratulations to the players and coaches for a great season! The U17 Juvenile Girls also won Bronze at the Ontario Cup in Kitchener, winning the Medal game 60-49 over Strathroy. Congratulations to the players and coaches for a successful season. WAY TO GO WILDCATS!! !